ES-Mini on Tuesdays trading session is showing weak buying activity and last two days ES S&P500 futures are continuously whipsawing around previous week high which indicates a possible weak buying. 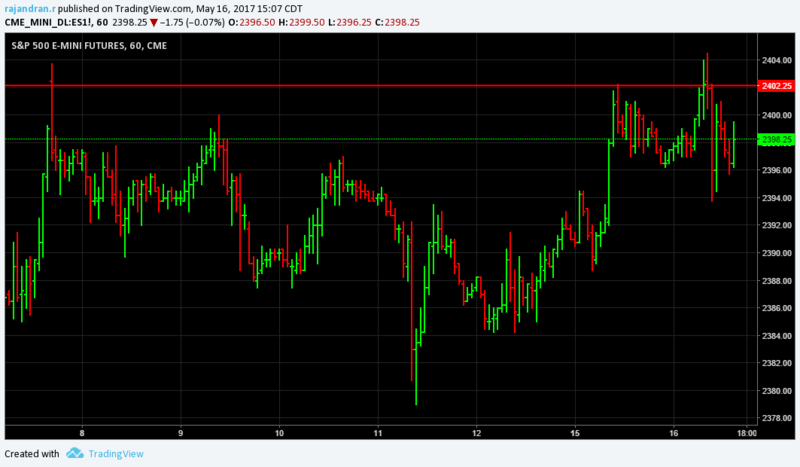 Resistance is built around 2402.25. Price is whipsawing around the psychological reference around 2400. Volatility $VIX is largely dead however Tuesdays session brought some positive moement and currently trades around 10.61(+1.82%) . Increased volatility is the key towards near term weakness. Short term indicates weakness and price acceptance below 2400 indicates a possible downtrend setup towards 2378 reference in the very short term. Regular trading session holding below 2400 psychological level with lesser whipsaw remains the key for the short term downtrend to happen.